Still in prison, Oliver (Stephen Amell) faces his biggest challenge yet. Meanwhile, Felicity (Emily Bett Rickards) gets an intriguing offer, and Diggle (David Ramsey) asks Curtis (Echo Kellum) to go undercover for ARGUS. Gordon Verheul directed the episode with teleplay by Onalee Hunter Hughes & Sarah Tarkoff and story by Elizabeth Kim (#703). Air Date: Monday, Oct. 29 (8:00-9:00 p.m.) on the CW. 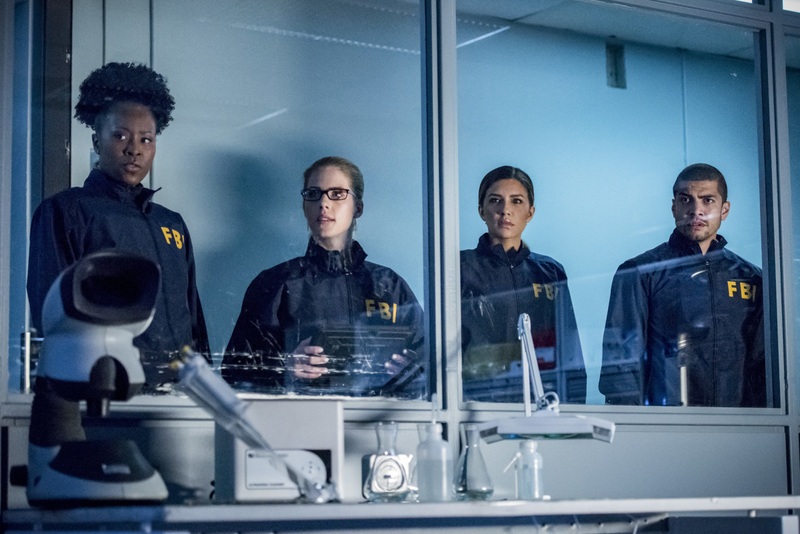 Arrow -- "Crossing Lines" -- Image Number: AR703b_0058b -- Pictured (L-R): Sydelle Noel as FBI Agent Samanda Watson, Emily Bett Rickards as Felicity Smoak, Juliana Harkavy as Dinah/Black Canary and Rick Gonzalez as Rene Ramirez/Wild Dog -- Photo: Dean Buscher/The CW -- ÃÂ© 2018 The CW Network, LLC. All Rights Reserved.